PLEASE NOTE the following--READ THIS IF NOTHING ELSE: We have multiple condos. If this condo is not available, please send an inquiry so we can provide you information on our other condos. This is stated in the RATES section of this ad but in case you don't make it there, we want to state it here--We have a Saturday to Saturday seven night minimum during the summer months (June, July and August) and a three night minimum all other times. REFERENCE PETS--pets must be approved in advance. Pets must be of select breeds, at least 2 years old, up-to-date on all shots and treatments and crate trained. 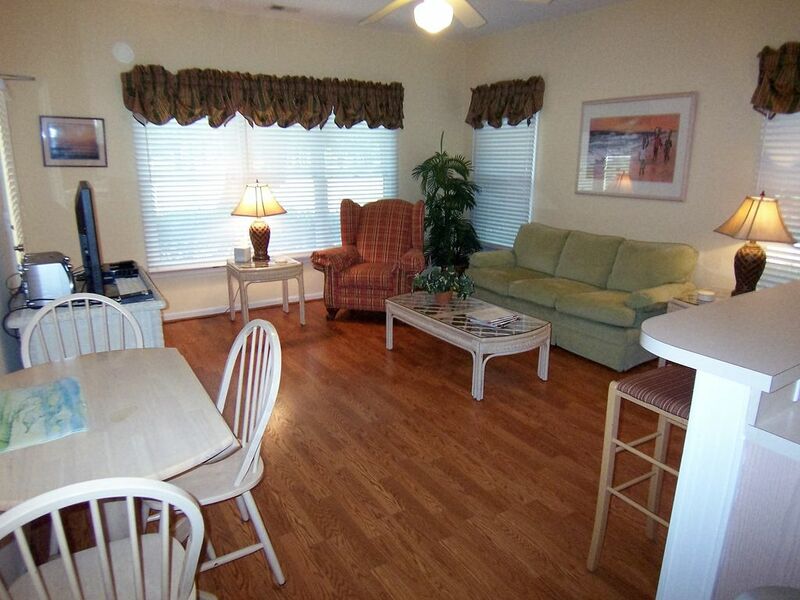 This is a ground floor unit at Sea Trail Resort that offers all the amenities of home and more. The spacious living room has a television, DVD, and stereo. A patio that overlooks the Dan Maples golf course is perfect for your morning coffee or afternoon cocktails. The kitchen includes a microwave, oven, dishwasher and all your cooking necessities for a quick lunch at the bar or a gourmet dinner at the dining table. A washer and dryer, hairdryers, iron and ironing board are all provided for your convenience. The master bedroom includes a king bed, television and full bathroom. The second bedroom includes 2 queen beds, full bath, television mini-fridge and coffee maker with accoutrements. Sheets and towels are provided for your convenience. We are pet friendly so it is not necessary to leave them at home; however, your pet MUST be approved by the owner prior to your arrival. This is such a great location! Sea Trail offers a nice resort setting with 3 Signature Golf Courses, walking trails, swimming and fitness center, dining and even activities for the children as well as being just one mile from the beach. Sunset Beach was voted “Best Beach on the East Coast” by Duke University and is the southern most Barrier Island in North Carolina which hosts one of the last swing-bridges left on the east coast. Sunset Beach is one of the cleanest and least commercial beaches; the flat white sandy beach is unparalleled in beauty. You can enjoy swimming, shelling, fishing and beautiful sunsets at the beach or take a three mile stroll and visit Bird Island, a natural protected area on Sunset Beach. Our Condo is for all age groups! There are over 100 Golf Courses in the area, Dinner Cruises on the Inter Coastal Waterway, Shopping, Dining, Horseback Riding Deep Sea or Pier Fishing, Kayaking or Canoeing, Museums, Art Galleries, Historical Tours and More. Calabash, “The Seafood Capital of the World” is just 2 miles to the south. It hails numerous good restaurants, fantastic shopping and docks where you can pick up the fresh “Catch of the Day” for a fabulous dinner. Myrtle Beach is about 10 miles past Calabash. Stop in Little River on your way, where you will find dining, shopping and Casino Boats. Myrtle Beach hosts a wide array of activities for everyone, and unsurpassed number of Golf Courses and miniature golf for the little ones or young at heart. There is every water sport imaginable, countless restaurants, dancing/ night clubs, amusement parks and a lot of shopping. The Hard Rock Café, Broadway at the Beach, NASCAR Theme Park, House of Blues, Aquarium, Arcades, Imax Theatres, Clubs, Live Entertainment Theatres, Tanger Outlets and much, much more. Ocean Isle Beach is 5 miles away. Here you can enjoy Dining on the Waterway or the Ocean, the Coastal Museum, Waterslide, Miniature Golf, Biking and the Beach with numerous access points and parking. Wilmington is about 45 minutes north of Sunset Beach. This historic town is a must see, with quaint shopping, exceptional restaurants, theatre, beautiful historic architecture and the Battleship USS North Carolina. Sunset Beach is the perfect destination, centrally located for easy access to Myrtle Beach and Wilmington. Enjoy a beautiful tranquil beach experience without having to fight the crowds for a spot on the beach but yet a short drive away from all the activity. The Best of Both Worlds! Sunset Beach is easily accessible via Interstate 95, Highway 17, and Interstate 40. Driving distances from a few select major cities are as follows in miles: Asheville, NC -291; Atlanta, GA -356; Cincinnati, OH -620; Knoxville, TN -395; New York, NY- 655; Pittsburgh, PA – 607; Washington, DC - 423. Environmentally green features include: new high efficiency heating and air systems, automatic door closers, CFL light bulbs, water saving devices and procedures, programmable thermostats and more to numerous to mention. Reference pets: While this condo is pet friendly, pets must be approved in advance. Pets must be of select breeds, at least two years old and crate trained. Keywords: Families, golfers, golf, vacation, vacationers--1 BR, 2BR, 3 BR, 4 BR, family, luxury, environmentally green. This condo is rented for a minimum of 3 nights year round except for the summer nights when a Saturday to Saturday 7 night minimum stay is required. This unit does not have a land line; however, many others do so please ask. 4 sets of bath linens per bathroom. Internet access is provided at no charge. Super nice villa located on Maples golf course. Good location for seeing the area. Close to good Calabash, NC restaurants and fishing boats. Easy access to bypasses to reach Myrtle Beach, MB Airport, shopping and other great locations. Thank you John and Kathy. We are glad you enjoyed your stay. We hope you will return again and again. If you have any suggestions for enhancements to improve our guests' stays, please let us know. It was a pleasure meeting you. It had been 10 years since our first stay at Sunset Beach and amidst all the changes to the area one thing was the same....our lovely condo at Sea Trail! It was just as convenient as we remembered. It was quiet and spotless! Our dogs enjoyed the area as there were plenty of areas to walk and a nice beach to show them the ocean! The distance to the beach is a very short drive from the condo and if you desire, there are pool privileges available for an additional fee. The restaurants surrounding Sea Trail were great and it was convenient to shops and restaurants to satisfy seafood cravings. Gerald Oakley is wonderful to deal with and gives very prompt responses to any questions you have. The rates are very reasonable. Do not hesitate especially if you are looking for a quiet pet friendly beach vacation. Rest assured we will not be waiting another 10 years to return! My wife and I stayed for 9 days and were joined by my son, daughter-in-law and 17 month old grandson for 4 of those days. The accommodations were clean, comfortable and well-stocked with items to make our stay a pleasant one. Gerald, the owner, was excellent to work with both before the stay and helpful during our stay. Although Sea Trail is a quiet place, we found things to do onsite (golf, Activities Center with indoor and outdoor pools), close by (planetarium, Sunset Beach, Ocean Isle, movies), and within a short drive (Barefoot Landing, Broadway on the Beach, and Tanger Outlets in Myrtle) to satisfy our desire for activity. The only thing missing from the immediate area are nice restaurants. There are several ice cream, hamburger, pizza, and fast food type of places very near--and the hamburgers we got at Beach Burgers were great--but nicer restaurants don't seem to be present in the immediate vicinity. However, since we were on vacation, that wasn't much of a problem as we drove 15-30 minutes to Little River or North Myrtle and found several nice restaurants. (Many people would opt to drive a much short distance to Calabash). Overall, it was very a nice trip. If planning a trip to the Sunset Beach/Ocean Isle area, I would wholeheartedly recommend working with Gerald to secure a place to stay! Thank you for staying with us and thank you for the great review! We work hard to make sure everything is in order for our guests and it is worth the effort when we receive nice comments like yours. We hope you will travel this way again in the near future. Thanks again. Club Villa is very lovely and right on the golf course.. Very open and clean except for dog hairs which we took care of. the owner is very nice to deal with and replaced our coffee pot and tea kettle right away. The king bed was too soft for us with the the topper, which we took off the next day and slept great. enjoyed the screened in porch when weather was nice. I would recommend this property. This was the first time we stayed on the 1st floor and we prefer the 2nd floor. Hopefully if we rent again we will get a 2nd fl., we thought we would be in one of the newer buildings, but was not disappointed and we loved the hardwood floors, they were easy to keep clean. Thank you for your review. It was a pleasure meeting you during your stay. Our cleaning crew missed cleaning a sofa cushion so we regret you found a few pet hairs there. We are very conscientious and proud of making sure our units, while pet friendly, appear to be non-pet friendly. Many of our guests tell us they would not know our unit is pet friendly--they couldn't even tell a pet had been in the condo. Reference the bed--we have installed memory foam mattress pads on the beds in most of our units and to rave reviews; however, we understand it takes a few days to get used to the Tempu-Pedic feel. If you desire a harder mattress, we will be happy to move the pad before you arrive. However, don't miss out on an opportunity for a great night's sleep. This unit is in the second newest building complex in Sea Trail; only the Champions units are newer. Thanks again for your review and staying with us. Your business is very much appreciated.